My friend Frank Concilus came to Korea in 1966 as a teacher with the Peace Corps. He returned to the States and received a graduate degree in Asian Studies in 1970, then came back to Asia for two or three years’ practice in Asian languages. He stayed. He married a Korean woman, they had a child, and he took two jobs, one teaching English at a Korean university and one teaching anthropology and sociology at the branch of the University of Maryland on the U.S. Army post. Some people smile and call Frank “just a real sweetheart” and others like to go running with him. He has a wonderful, gentle, somewhat self-depreciating sense of humor and an interesting sense of perspective. Here are Frank’s words from an interview done in 1993. When I was in graduate school, I did a couple of papers on Siberian shamanism, and my interest continued after I returned to Korea. Whenever I heard the chiang-chiang-chiang-chiang-chiang of cymbals and drums I would just show up and stand around until someone invited me in. I’ve always been able to gain admission because as a foreigner I’m an oddity. I enjoy the music, which may not sound like music if you’re not used to it. There are hourglass drums and cymbals, and the shamans sing and chant. And there’s a lot of humor and drama. Anyway, I was watching a kut with about ten students when the ancestor segment came up. This is where the ancestors of the person sponsoring the kut come back and speak through the shaman, starting with the most distant ones. After several spirits had come and gone, the shaman suddenly put on tennis shoes and wrapped a sweatshirt around her waist—clothes a teenager would wear. I thought this must be the spirit of the dead son. The shaman danced and became possessed with his spirit. After jumping up and down on her toes and doing the dance, she came up to the mother and started crying and yelling, “Mother! Mother!” The mother burst into tears, and the daughter-in-law started crying. That kind of outburst is common. Sometimes the musicians don’t pay any attention to what’s going on, but this time they were kind of loud. When I looked over I thought they were embarrassed because ten guests—most of them foreigners—were sitting watching these three people, who were crying buckets. The musicians served us some little tonic drink to distract us. The shamanist ancestor segment is very different from the Confucian ceremonies for ancestors. Basically, in the male, Confucian chesa, it’s direct patrilineal principles that determine who’s venerated in a very dignified, unemotional way. In a shamanist performance anyone and everyone appears—the relatives on the wife’s side, the husband’s side, the mother’s side, the father’s side. No one gets left out. Another segment you almost always see uses Buddhist gods. There’s a group of them that appear together. For example, there’s a pregnancy and fertility myth about a monk who comes down from the sky and impregnates a maiden. Her family tries to kill her by burying her alive in a cave. Weeks later when they dig her out, she’s got a healthy set of triplets. When the children grow up, they plant magical seeds, and vines or gourds spring up to lead them to their father. 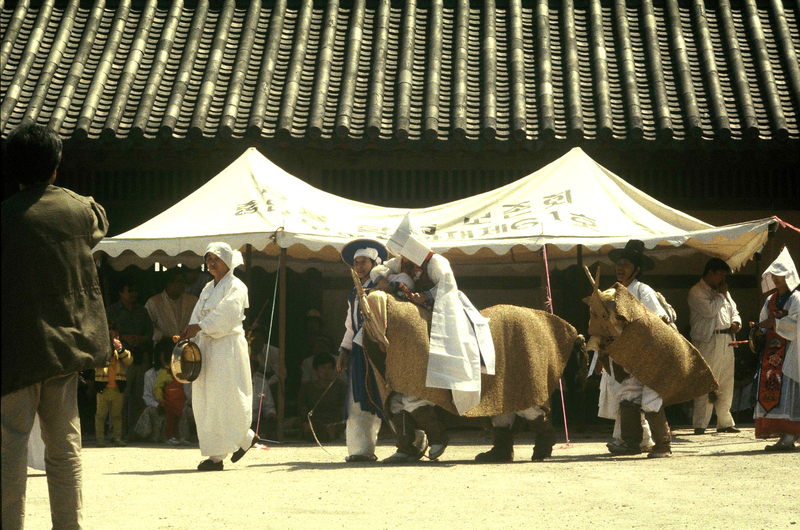 In the Seoul area that segment is called “God Chesok” or “Chesok-nim,” after the monk in the myth, or Samshin Halmǒni [Three-god Grandmother], after the mother of the triplets, who are represented as the three Buddhas. There’s always meat on the altar, a pig’s head or cows hooves. The meat’s covered up with white paper when the Buddhist deities appear because they don’t drink alcohol or eat meat. 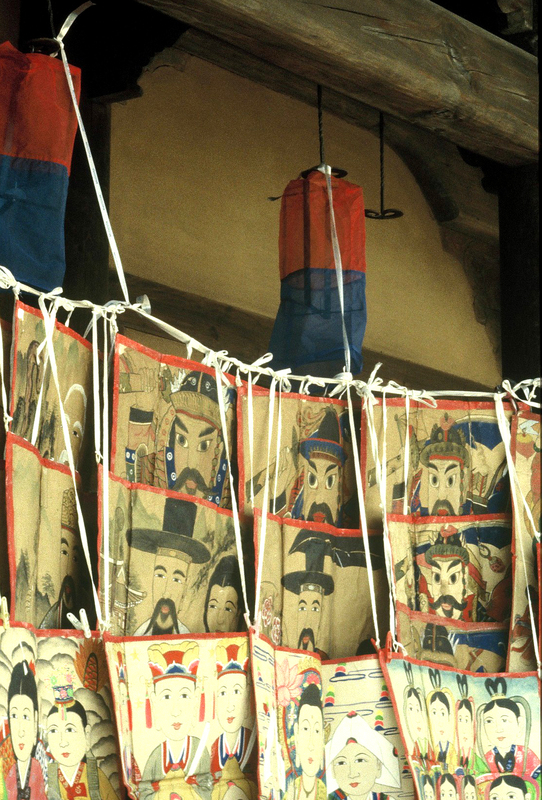 A typical good-luck performance will have mountain gods and martial gods—generals—wave knives around and even ride on the sharp parallel blades of the fodder choppers. These are bolted together so that the sharp side of the blade is standing up perpendicular to the base. Then the shaman climbs on top of the blades. I’ve seen a male shaman do it with a pig over his shoulder. Sometimes the shaman holds onto something for balance. At first the shaman can rest her feet on the cloth, but then she generally slides or moves her feet so that each foot, or at least most of the foot, is right on top of the blades. At the good-luck kut you and I saw, there was a procession of people dressed as farmers and two people in a cow costume. It was a type of festival performance for the town’s tutelary deities. There’s a famous one down south where the spirit is thought to descend into the village during the festival. In the Yi Dynasty a lot of the festivals became Confucianized, and then the ceremonies were presided over by the males of the community who are in a ritually-pure state. But apparently, at some of these Confucianized festivals, shamans still play a role. At others they officiate, and then the festival is a kut. 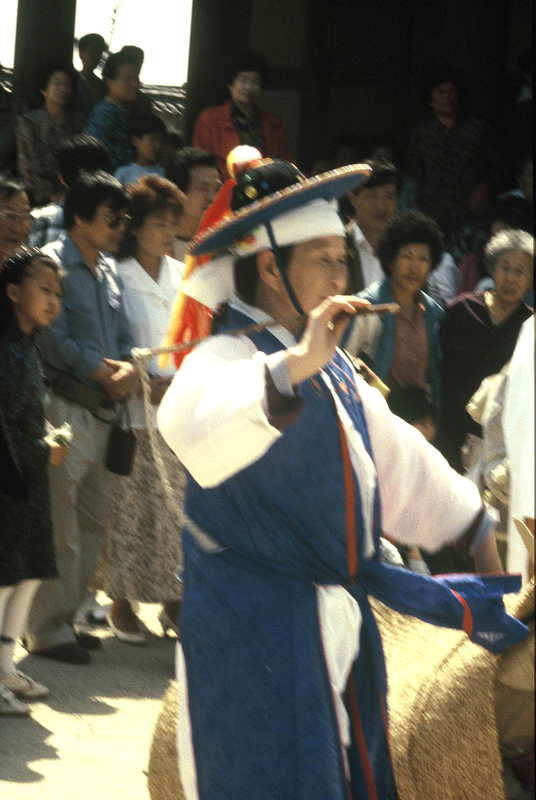 On the Korean peninsula I think there are two different kinds of shamans. Supposedly a hundred years ago the Han River was the dividing line between the two. Shamans north of the Han were the possessed variety, and the ones to the south were hereditary priestesses. Sometimes a possessed shaman will talk about her earlier experience, which is similar to the initiatory sicknesses of the Siberian shamans. They start acting strange. They have gastrointestinal complaints. They hallucinate. They see visions. They predict fires. They walk around shouting, “I’m this god. I’m that god.” They wander off into the woods. Then traditionally a shaman will see that they are possessed, rather than crazy. If you are behaving that way and a shaman says a spirit is calling you to be a shaman, you can’t refuse. Otherwise, you go crazy and die. So this person—sometimes it’s a man, but usually it’s a woman—has an initiation ritual and becomes apprenticed to a “spirit mother.” Then she’s cured. It’s therapy for her. After she returns to normal she has to shamanize to remain well. She may not want to do it because traditionally shamans are in a socially marginal position. People look to them for help and depend on them, but despise them at the same time. The hereditary shaman has no particular facility of possession, although she may mimic it a little in dance. In other words, when she’s dancing she may jerk her shoulders or twitch a little bit, somehow showing that the spirits have descended, but she doesn’t speak in the voices of spirits. What she does, from what I’ve been able to put together, is play a role in helping ordinary people become possessed. Once down in the southeast coast, a group of young men drowned in a fishing accident. The families had an elaborate kut because unmarried males who have died are especially likely to be restless and cause trouble for the living. So you’d better make sure they’re satisfied in the other world. At this kut mothers or family members of each to the drowned men danced and held a spirit basket. When the basket started shaking, the shaman asked them yes-or-no questions. The spirits indicated by shaking the basket if the answer was yes and not moving it at all if the answer was no. Sometimes the mother or the sister or another family member was possessed by the spirit of the dead boy and spoke in his voice. There’s a shaman’s union here of I think around two thousand shamans. The male shaman I’ve seen at the shrine seems to have a position at the shaman association institute. Down in the basement of the building people learn the chants and the dances and the other things shamans need to know. When the head shaman has a kut, the students are given a subsidiary role, maybe as percussionists. People usually get carried away to some degree or another. At the last one I saw, the star student actually spoke in a god’s voice. Obviously she’s becoming a shaman. The key question would be how did those students get to the basement of that building? Have they all been diagnosed, or are some of them there just out of curiosity? The students all sat there staring at him with open mouths. 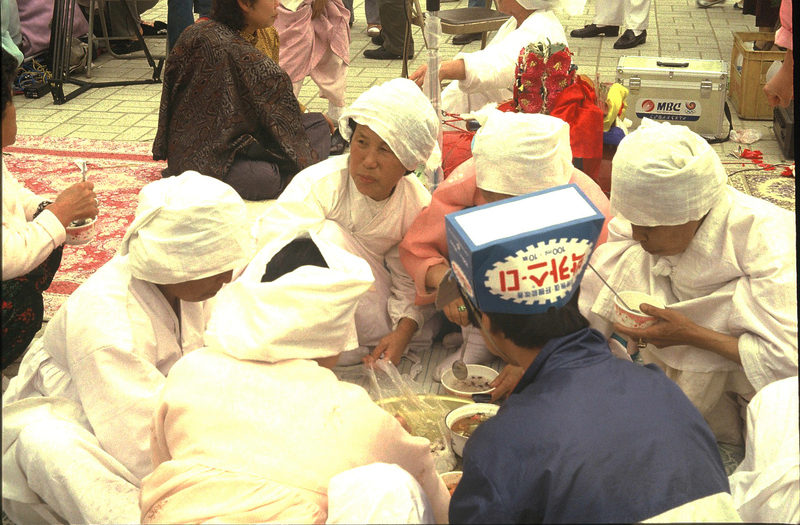 During a regular kut there are purification rites, which involve waving knives over people and pelting them with millet and salt to drive away the spirits. The woman sponsoring the kut and her husband will kneel down in the room and face out into the courtyard, and the shaman will drape divination flags over their heads, help them with purifying substances, wave chicken’s and pig’s legs over their heads, tossing these things out in the courtyard, or spit rice wine over their heads and out into the courtyard. This is to purify them. More elaborate measures are called for if someone’s ill or crazy. 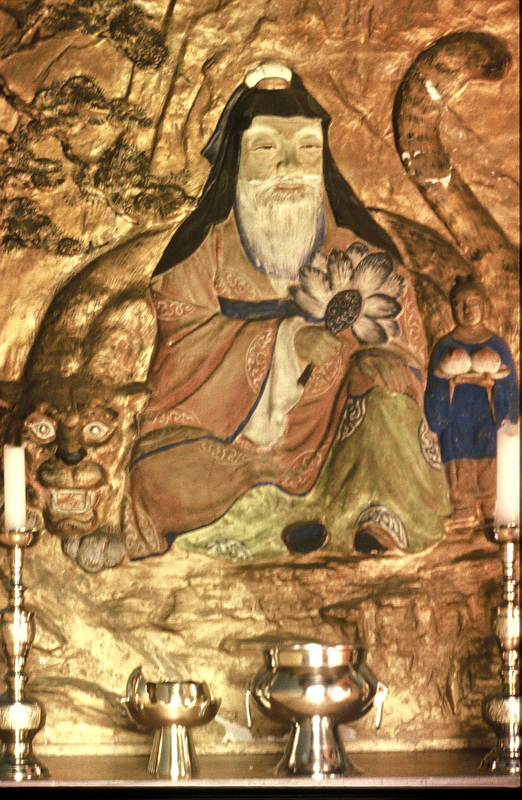 Korean Buddhist temples have a shrine or two, like the one dedicated to the mountain god, which is obviously connected with shamanism. But I don’t know of any monks exorcising evil spirits, although they do perform a mass for the dead and pray for the dead. The main Buddhist order here discourages fortune-telling, but certainly traditionally monks have done that. When monks tell fortunes they use various techniques, they read your face or your hand, but they don’t commune with spirits. They also draw good-luck talismans, pieces of paper you paste on the wall or put behind the dresser to keep your husband faithful—that kind of magic. It would seem that Buddhism has influenced shamanism, not the other way around. Some of the shamanist deities are associated with Buddhism. The shamans themselves may be Buddhists or go to temples often. At the folk level, people confuse the two. So if you ask village people about shamans, they may start talking about popular Buddhism—it’s just folk religion, folk beliefs. Some people will visit both temples and shamans. And some families that are devout Buddhists will avoid shamans and go only to temples. Obviously, people feel anxiety about the future, and so they want to be reassured or at least prepared for what’s going to happen. I’ve read that in the country’s past there were times when at the higher levels of society, people used shamans to do other people in—to put a hex on a husband’s girlfriend, for example. But today there’s almost none of that. 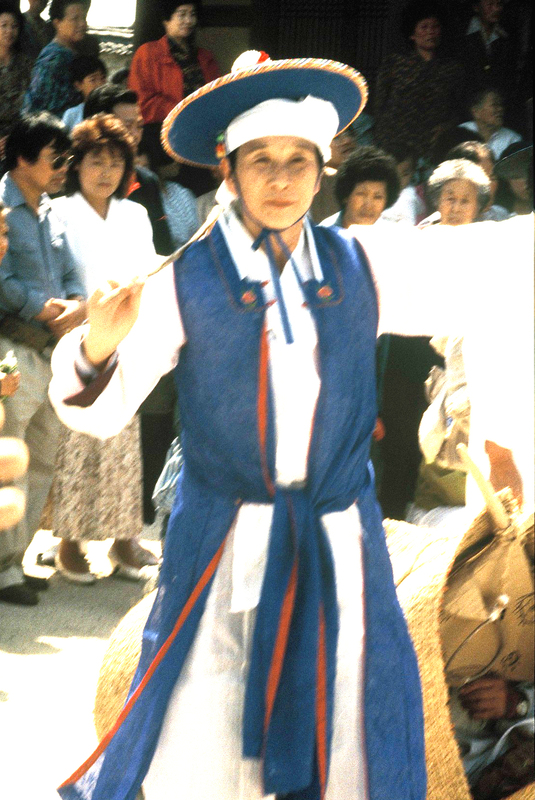 A Korean psychiatrist says that the good thing about Korean shamanism is that it’s very humanistic. It aims toward harmony—people in the family getting along well together. New attention gets paid to someone who’s been neglected and is suffering. Or there’s a focus on prosperity and health, children, wealth and those kinds of things. According to the psychiatrist, the bad thing is that shamanism is a system of projection. People are encouraged to see their good fortune or bad fortune as a result of outside agencies. It has people look outside for their good luck. So if things aren’t going right it’s because of an ancestor or a spirit of some sort, it’s not because of anything you are or aren’t doing. Which seems to have some truth in it. Once you get hooked up in this thing, once a shaman gets to know you and your history, every time you see her, she’ll say, “You know we really need to do a rite for this spirit.” You get into the thing and let the spirits determine what your life’s going to be like, and then you’ve got a lot of obligations to these spirits. You have to dedicate robes to deities, and all kinds of other things come up—maybe to the level that you can afford to enlist supernatural aid. I think people sign up for my shamanism class because they’re really interested in this sort of thing. The Americans are curious, but skeptical. The Koreans are interested because young Koreans seldom know very much about it. They may have seen a ritual when they were young, but they don’t know the details, like who the gods are. Occasionally, a Korean student will be a Christian and have more invested in being skeptical. He or she may be a little threatened by it all. I’m interested in it myself, so I put a lot of energy into the class.